: Assistance with fishing and retrieving as well as companion dog. : Portuguese Kennel Club. Revised by R. Triquet & J. Mulholland and Renée Sporre-Willes. : In ancient times, the Portuguese Water Dog could be found throughout the entire Portuguese coast. Thereafter, due to continuous changes in fishing methods, the breed was located mainly in the Algarve region which is now considered as its original birthplace. 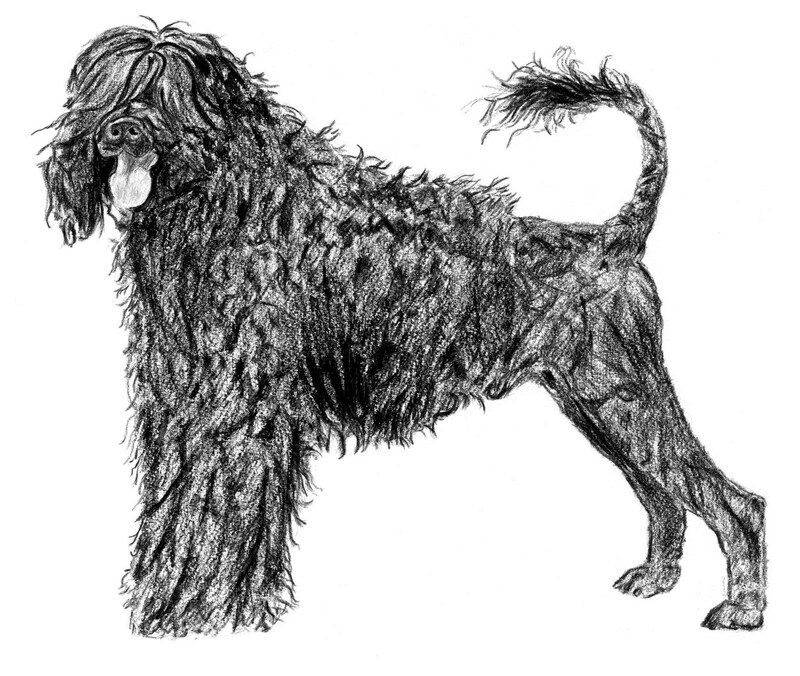 Its presence on the Portuguese coast is probably very remote and thus the Portuguese Water Dog should be considered as an autochthonous Portuguese breed. : A dog of medium proportions, bracoïd tending to rectilinear to slight convex. Harmonious in shape, balanced, strong and well muscled. Considerable development of the muscles due to constant swimming. Of almost square shape, with the length of body approximately equal to height at the withers. The ratio of the height at the withers to the depth of the chest is 21; the ratio of length of skull to muzzle is 43.
: Exceptionally intelligent, it understands and obeys easily and happily any order given by its owner. An animal with impetuous disposition, wilful, courageous, sober and resistant to fatigue. It has a severe, penetrating and attentive expression, as well as remarkable visual and scent faculties. An excellent and resistant swimmer and diver, it is the inseparable companion of the fisherman for whom it performs a multitude of tasks, both in fishing and in guarding and protecting its boat and property. While fishing, it will willingly jump to sea to retrieve escaped fish, diving if necessary and likewise if a net breaks or a cable becomes loose. It is also used as a liaison between boats and shore or vice-versa, even at great distances. : Well proportioned, strong and broad. Parallel longitudinal axes of the skull and muzzle. : Seen in profile it is slightly longer than the muzzle (43). Its curvature is more accentuated at the back and the occipital protuberance is pronounced. Seen from the front the parietal bones are rounded with a slight depression in the middle; the front is slightly hollow, the frontal furrow extends to two thirds of the parietal bones and the superciliary arches are prominent. : Well defined and slightly behind the inner corners of the eyes. : Wide, with well open and pigmented nostrils. Black in black, white and pied animals. In brown specimens the nose is the same colour as the coat, but never marbled. : Straight, broader at the base than at the extremity. : Thick, especially in front. Commissure not prominent. Mucous membranes (palate, under the tongue and gums) deeply pigmented in black, deep brown in brown dogs. : Strong, healthy teeth, not visible when mouth is closed. Strong and well developed canines. Scissor bite or pincer bite. : Medium sized; noticeable and rounded in shape; set well apart and slightly slanted. The iris is black or brown and the lids are thin and black edged, brown in brown dogs. Unapparent conjunctive. : Set above the eye line, held against the head, slightly raised from the rear and heart-shaped. Thin in texture, their extremity never reaches below the throat. : Straight, short, rounded, well muscled, well set and carried high; connecting to the body in an harmonious transition. Without ruff or dewlap. : Wide and not prominent. : Straight, short, broad and well muscled. : Short and well connected to the croup. : Well proportioned, slightly sloping with symmetrical and non apparent hip bones. : Wide and deep. Its lower edge should reach the elbow. The ribs are long and well sprung, providing great respiratory capacity. : Gracefully shaped and reduced in volume. : Natural, of medium set-on, thick at its base, tapering towards the end. Should not reach below the hock. When attentive curls in a ring, not reaching beyond the middle of the loin. It is a useful aid for swimming and diving. : Strong and straight. Upright. Slightly sloping pasterns are admissible. : Slanting in profile and transversely. Strong muscular development. : Strong and medium in size. Parallel to the main body line. : Long and strongly muscled. : Strong bones, broader when seen from the front than from the side. : Rounded and flat with slightly arched toes of medium length. The webbing, extending over the whole length of the toes, is composed of limp tissue and covered with abundant and long hair. Black nails are preferred but, according to coat colour, may also be white, striped or brown. The nails do not reach the ground. Hard central pad and normal thickness in the other pads. : Identical to the forefeet in all aspects. : Upright and well muscled. Slightly sloping hocks are admissible. Buttock: Strong and well rounded. : Strong and medium in length. Very well muscled. Stifle joint turned neither in nor out. : Long and very well muscled. Turned neither in nor out. Well slanting from front to back. All tendons and ligaments are strong. : Easy movement with short steps at walk; light cadenced trot and energetic gallop. : Thick, supple; not very tight; internal and external mucous membranes preferably pigmented. The whole body is abundantly covered with strong hair, with no undercoat. There are two varieties one long and wavy and the other shorter and curly. The first is slightly shiny and woolly; the latter is dense, lustreless and forms compact cylindrical curls. Except for the underarms and groin the coat is even all over the skin. On the head it forms a topknot of wavy hair in the long and wavy variety and of curly hair in the curly variety. The hair in the ears is longer in the long and wavy variety. The coat is black or brown of various shades, or solid white. In black or brown coats, white is accepted in the following locations muzzle, topknot, neck, forechest, belly, tip of tail and lower extremities of the limbs, below the elbows and hocks. The white coat must not be albino, consequently the nose, eyelids and inside of the mouth should be pigmented in black, and brown in brown dogs. In this breed partial clipping of the coat, when it is too long, is typical. The hindquarters, the muzzle and part of the tail are clipped, leaving a plume of full length hair at the tip of the tail. Males 50 - 57 cm. Ideal height 54 cm. Females 43 - 52 cm. Ideal height 46 cm. Males 19 - 25 kg. Females 16 - 22 kg. Head: Too long, narrow, flat or pointed. Muzzle: Too tapered or pointed. Eyes: Light, too protruding or too sunken. Ears: Incorrect set, too big, too short or folded. Tail: Heavy, dropped in action or raised perpendicularly. Behaviour: Aggressive or overly shy. Eyes: Wall eye, uneven in shape or size. Tail: Docked, rudimentary or non-existent. Coat: Hair different from the described types. Colour: Brindle; black and tan; tricolour and totally white. Any dog clearly showing physical or behavioural abnormalities shall be disqualified. Albinism, marbled nostrils in whole or in part. Any other colour than the described type. Any dog clearly showing physical or behavioural abnormalities shall be disqualified.